Videoslots Casino just presented a new excellent feature, called My RTP. 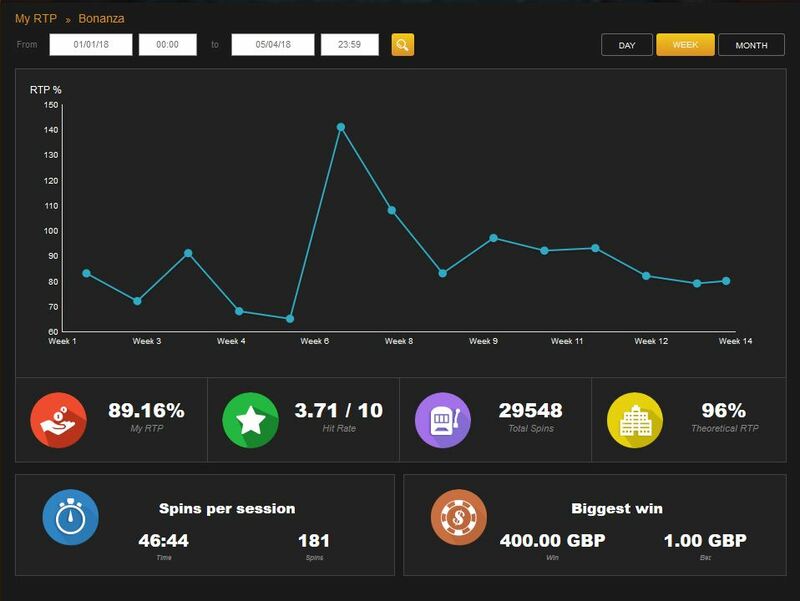 This new feature allows the player to have detailed statistics on their play at the casino and work out the Return to Player (RTP) not only for each slot but also for particular sessions over a period of time. You can instantly see that my overall RTP at the casino sits at a very respectable 96.5% with the worst performing game being Rainbow Ryan and the best performing game being Kingdom of Titans. A total of 29,548 spins were made with the biggest win being £400 off a £1 spin. The game has been pretty brutal for me though with a personal RTP of 89.16% compared to the games RTP of 96%. Statistics go back as far as July 2017 and are updated immediately once you leave a slot. The statistics equal, and arguablly are better than, those of Slottracker. All that is missing are the community statistics so that you can compare your performance against others. So there you have it, yet another good reason to join Videoslots Casino! You can not only now track your RTP, you earn wager free cashback, get ingame rewards as you spin the slots, participate in the free roll battles and earn race points as you make a spin over £0.20 that enters you in to the race for yet more wager free cash back. Add to that the largest selection of games available at any casino, and there really is no other place to play your slots. If you haven’t got an account yet with Videoslots, then sign up today and enjoy a welcome bonus of a 100% deposit match of up to £400 plus and extra 161 spins on Starburst on your first deposit of at least £20. Favourable terms- and conditions do apply, so make sure you make yourself familiar with these. As always, all times quoted are UK times with the finish time very much depending on how the session is going. I will always try not to re-deposit so once the money is gone it is gone! Play will be at Winning Room casino to start off with. A 100% deposit match bonus will be credited to the account with wagering duly starting when bonus funds are hit. Of course, if I hit before touching these bonus funds, then I can forfeit the bonus and withdraw the cash. That is the beauty of such “parachute” or “second chance” bonuses. Mind you, the wagering is quite challenging though! Because of a dispute at Videoslots Casino, I am not sure whether I will still be playing there. To briefly explain, they are now requesting source of wealth documents. This kind of document is required to be provided if they have suspicion of money laundering. It appears that Videoslots may have misinterpreted the respective European Act and/or misinterpreted the guidance given by the UKGC because they are asking such documents from all of their UK customers. Until this issue has been resolved, they have blocked all deposit and withdrawal options from my account. Until next week, may the slots be lucky for you! Some great news for UK players as Videoslots today announced that Novomatic games are now available for us English players! Games such as Captain Venture (one of my favourite ones! ), Mighty Trident, Book of Ra Deluxe (one of the classics) and Rumpel Wildspins can now be played within the English territory. More games have been promised for release in October. There now really is no reason to go to another casino for your slot fun. The number of slots and providers at Videoslots is without doubt the biggest one can find on the internet. I challenge anybody to find a casino with a greater selection of slots to be played. Not only is the slot selection massive, you can rely on super fast withdrawals if you’re lucky enough to beat the odds and beat the casino. Payments are usually processed within 30 minutes. But not only do fast payments give good reason to join Videoslots, you have the weekend booster and the weekly race winnings to look forward to. All of these rewards are totally wager free and the monies can be withdrawn immediately provided the minimum withdrawal amount is reached. And we shouldn’t forget the in game rewards and the exclusive free roll battle of slots. Joining Videoslots casino through my link gives you the benefit of a 100% deposit match bonus of up to £400 (normally just £200) with an industry low wagering requirement of 20x the bonus. Please take into consideration that the bonus is released in 10% increments as you wager 10%. In addition to this deposit match bonus, you will be given 161 free spins on your first deposit of just £20. Wagering on the winnings of these free spins is a reasonable 40x. and enjoy playing those Novomatic games, whether you reside in the UK or not! Some dates to put in your diary, namely the weekend of the 26th and 27th August 2017 when the excellent Videoslots casino will, yet again, be hosting their now famous sit and go battle weekend. This time, the chosen slot is Book of Dead by PlayNGo. By now, most are familiar with this clone of Book of Ra and the potential that it has in terms of giving decent winnings. To qualify for the free roll battles, deposits totalling just £20 and total wagering of just £200 needs to be made between the period of 7th August and when the battles commence at midnight on Saturday 26th August 2017. The battles close at 23:59 hrs on Sunday 27th August 2017 by which time participants may have earned wager free spins by ending in the top positions of each of the battles. There are two kind of battles that can be participated in. There are 10 player battles with the 1st position earning 6 free spins, the second position earning 5 free spins and the 3rd position earning 4 free spins. The second type of battle is the 30 player battle with the top 3 players earning 6 free spins, those ending 4th till 6th each earning 5 free spins and those ranked between 7th and 9th position each earning 4 free spins. But if that is not enough, at the end of the battles the 4 players that had the highest winning spin during the free roll battles each earns a tasty wager free £250 cash. Joining Videoslots casino is as simple as clicking the below mentioned link. Joining today through the link gives you access to an exclusive welcome offer of a 100% deposit match bonus up to £400 (usually £200) with an industry leading low wagering requirement of just 20x the bonus amount. In addition to this, on your first deposit of just £20 you also get 161 free spins with a wagering requirement of 35x the free spin winnings. Please take into consideration that the aforementioned deposit match bonus is released in 10% increments as you complete 10% of the wagering. Some exciting news from the more than excellent Videoslots Casino. Starting from Friday the 4th August 2017, it just got that little easier to enter the two hourly free roll battles and gone is the frustration to find closed battles due to the number of participants having exceeded. Where previously there was space for 500 players, each free roll battle is now open to double the number of participants. The first 1,000 players entering each two hourly battle will now have a chance to win some wager free spins by battling it out against each other. But that is not all. Following feedback across forums, the entry requirement for these free roll battle has also slightly eased. Where previously it was required to have deposited €20 and wagered €200 or €500 each 7 days depending on the battle type, the same requirements are now needed each 14 days making it super attractive for low rollers and those that decide to take a break from gambling once in a while. Battle of Slots is unique to Videoslots and adds some extra fun to the casino experience and a good chance to earn some wager free money that can be used as a starting point for the next slot session or, of course, can be withdrawn provided the minimum withdrawal limit is reached. Joining Videoslots gives you the widest selection of games available, arguable the fastest withdrawals, wager free goodies such as weekly cash back and race money as well as in game rewards and access to the newly improved Battle of Slots. And enjoy an exclusive 100% deposit match bonus up to £400 (usually just £200) plus an additional 150 spins on top of the 11 spins when you first deposit a minimum of just £20. Wagering on the welcome bonus is just 20x the bonus with it being released in 10% increments as you wager 10% of the bonus play through. Some great news at Videoslots Casino! Commencing Monday the 17th July 2017 an improvement has been made to the casino race over at Videoslots Casino. Each spin made over £0.20 (excluding spins on progressive jackpot slots and whilst completing wagering) counts towards the weekly casino race where currently a pool of £60,000 is shared between the top 6,590 players. The top prize is a very tasty £500 and the runner up earning £350 which is not to be sniffed at. Prizes than gradually drop down to £3 for the bottom ranked player. What is excellent about the casino race is that the earnings are totally wager free and are paid each Monday into the players account. Joining the improved casino race is pretty simple. Just keep spinning the slots and each spin over £0.20 will improve your position on the leader board. New players at Videoslots Casino have the opportunity to earn an exclusive 100% deposit match bonus of up to £400 (usually it is a maximum of £200) with a wagering requirement of just 20x the bonus. This is one of the lowest in the industry and gives you a great chance of a nice cash out whilst at the same time enjoying extended play time. Please take into consideration that the bonus money is released in 10% increments as you complete 10% of the wagering. In addition to the 100% deposit match welcome bonus, you also get 161 free spins if your first deposit is at least £20. Yet another opportunity to cash out some money! But there is, of course, more! As you play the slots, you earn cash back that is paid each Friday and – of course – is wager free. And we should also not forget the free roll battles in their exclusive battle of slots as well as the in game rewards. So get spinning those slots, earn points on the leader board and in the process earn some wager free dough to start the new week off with. How do you fancy grabbing a chance to win one of five Ipad Pro’s at Videoslots Casino or the chance of a share of 2,500 spins on the ever so popular IGT slot Cleopatra? Partaking is very easy. Load up either the IGT slot Cleopatra or Cleopatra Plus and keep spinning those reels. For every €5 (or currency equivalent) wagered between now and close of play on the 14th May 2017 you earn one ticket into the raffle. The more you wager, the more tickets you will have in the raffle. But not only do you have the chance to win one of these 5 Ipad Pro’s, each day 10 lucky players will receive 50 free spins (wager free of course!) on the Cleopatra slot. The five lucky winners of the Ipad Pro will be drawn before the 20th May 2017 and will be notified by Videoslots. Don’t fancy an Ipad Pro? A cash alternative of not more than €600 may be selected instead. The Ipad Pro is the 32GB version with a screen size of 9.7 inch. It may take up to 2 months for it to be delivered to your home address if you’re lucky enough to win it. Both the Cleopatra slots are one of the most popular slots made by innovative game provider IGT. The slots feature a very distinct Egyptian theme with smooth graphics. They have been popular at the brick and mortar casinos and are now available for your playing pleasure online. Signing up at Videoslots casino now via the below mentioned link guarantees you an exclusive welcome deposit match bonus of 100% up to £400 (normally just £200) plus an additional 150 free spins on the ever so popular slot Starburst on top of the 11 free spins you get when depositing just £20. Remember that the chance of winning one of the 5 Ipad Pro’s finishes at end of play on the 14th May 2017 so get playing either Cleopatra or Cleopatra plus sooner rather than later at Videoslots Casino. Not only do you have that chance to be one of the raffle winners, you earn of course cashback and race money whilst you collect those raffle tickets. No other casino offers so much so the decision to play at Videoslots is not a difficult one to make. Some really exiting news from Videoslots Casino for those residing in Ireland and Austria! Videoslots has now opened up their doors for your gambling pleasure if you live in Ireland or Austria. New customers will be excited to learn that they can take advantage of our exclusive sign up bonus of 100% up to €400 (normally just €200) in addition to getting 161 free spins on the ever so popular Starburst slot when depositing just €20. With arguable the largest selection of slot games available online from a wide variety of providers such as Netent, WMS, Big Time Gaming, Micro Gaming and PlayNGo you will never get bored playing slots online. Videoslots stands out from other online casinos by offering one of the fastest withdrawal speed and offering additional benefits such as weekly cash back, weekly races, in game rewards and the two hourly free roll battles. And most importantly, all of these rewards are wager free! Friendly chat support is available 24 hours per day, seven days a week, 365 days per year in case you run into any technical or other problems. 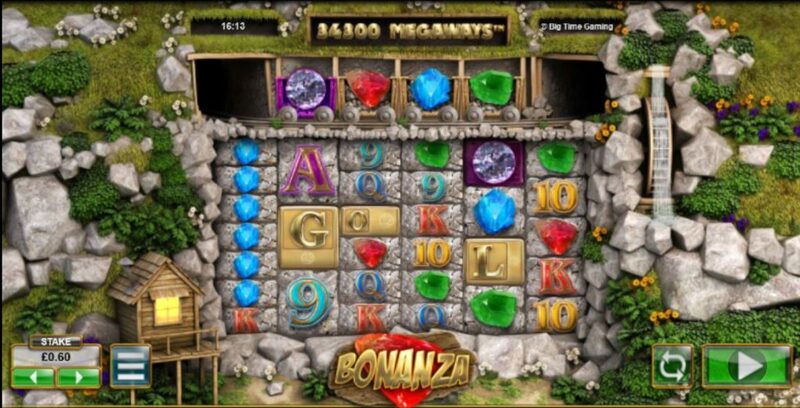 Those that are familiar with the Big Time Gaming slot called Bonanza know that it is super high variance taken to the extreme, it therefore making it the most dangerous slot one can play online available. The trouble, if you can call it that, with this slot is the length of time it can take to trigger the bonus round. This bonus round is triggered by having 4 or more scatters in view that spell out the word “Gold”. From both real and play money gaming, I know from experience that it is not uncommon for it take over 2,000 spins before you see this magic word appearing on screen. The next challenge playing this slot is, that when eventually the bonus does trigger, that it can really do you over by awarding wins between 0x and 20x stake. The bonus round is where the real money sits in this game with an unlimited (yeah right!) multiplier. The multiplier increases each time there is a win. The base game in Bonanza behaves itself usually pretty well. The balance doesn’t skydive too quickly. It is a little like an egg timer with the balance slowly but steadily heading towards bust town. Back in February of this year, I met one of the staff of Big Time Gaming in London and we had a discussion about Bonanza. I explained that us gamers don’t want to wait thousands of spins for a bonus to trigger. I compared the slot many a time to Netents Dead or Alive that is pretty high variance too. Unlike Bonanza, the bonus rounds in Dead or Alive triggers on average every 160 spins. The average bonus trigger frequency in Bonanza appears to be every 500 spins as comparison. During the aforementioned discussion with the Big Time Gaming representative, he sort of admitted that they had the bonus frequency wrong. Whilst they took a lot of time developing the game engine, he could see the frustration from a players point of view. Impressive isn’t it? But one should remember that wins like the 14,000x one are rare. I would even say super rare. You most probably have an equal chance hitting the Mega Moolah jackpot as hitting such a massive hit during the bonus round in Bonanza! So treat this slot with caution. Give it a few spins now and then and see if the bonus round triggers quick. Never chase it, because it more likely than not will end in disaster. I have done it before, chase the bonus round only to be mugged off with a bonus round that paid less than 50x. It was almost fist through screen time! Bonanza can be played on the excellent Videoslots Casino. Playing at Videoslots ensures speedy withdrawals if you’re lucky enough to be in that position. And, of course, you can partake in the two hourly free roll battles and enjoy weekly cash back and race money. In game rewards are offered too to boot.